PM, or Particulate Matter, is any piece of matter suspended in the air that fits within a certain size measurement. For example, PM 10 indicates particulate matter smaller than 10 micrometers in diameter - and PM 2.5 indicates particulate matter smaller than 2.5 micrometers in diameter . A comparison of the size of particulate matter is displayed in Figure 1. Particulate matter has been established as a major health concern to the human lungs - simply because they are small enough to be inhaled in the lungs themselves, and are allowed to accumulate there due to their small size . While larger measures of PM also pose health concerns, by far the most damaging size of Particulate Matter is PM 2.5 - otherwise dubbed "fine" particles. Because of their small stature, the can lodge deeply into the lungs, further than that of larger particles. It is believed that PM 2.5 is a major contributor to chronic lung disease. PM 2.5 is produced mainly by construction sites, industrial factories and coal mining . Figure 1 compares the size of particulate matter with the width of an average human hair. It is observable that PM 2.5 particles are much smaller than PM 10 and drastically smaller than the width of a human hair - allowing it to enter and accumulate in the lungs, where most damage is caused. The figure also states the possible substances that could make up the different types of particulate matter - with PM 10 consisting mostly of natural substances such as dust, whereas PM 2.5 is mostly made from results of heavy industry and human interference, such as combustion particles . PM particles are estimated to indirectly cause up to 52,000 deaths per year just in the united states, according to a study . A study in 2002 indicated that PM 2.5 not only accumulated in the lungs - it leads to high plaque deposits in the arteries themselves, due to the accumulation of particles deep in the lungs. This effect increases the chance of cardiovascular disease, most notably heart-attack. Thus, prolonged PM 2.5 exposure have expanded to affect other body systems, and not limited respiratory system as first predicted . The way particulate matter of different sizes enters the body is shown in Figure 2. Other body systems affected are most prominently the cardiovascular, immune and reproductive systems - systems directly affected by particulate matter entering the bloodstream through the lungs. PM 2.5 has been a major issue with premature births, premature deaths and birth defects . Another study conducted by the American Medical Association stated that an EPA increase of 10 micrograms per cubic metre led to a 4% increase of all-cause, 6% increase of cardiopulmonary, and 8% increase of lung cancer mortalities over long periods of time. Figure 2 shows how particulate matter enter the body, and what our body does to combat such disturbances. The diagram reveals how PM 2.5 particles are much more troublesome than its larger counterparts - entering the lungs themselves instead of being rejected and coughed out of the body. Figure 3 shows the various types of particulate matter commonly encountered. The X axis is a size measurement in micrometers, whereas the Y axis is the categorical grouping of the substances. PM 10 qualifies as anything smaller than the size of 10 micrometers, and PM 2.5 is any particle smaller than a size of 2.5 micrometers. As shown in the chart, by far the finest particulate matter consist of gaseous contaminants - namely aerosol and other gas chemicals. 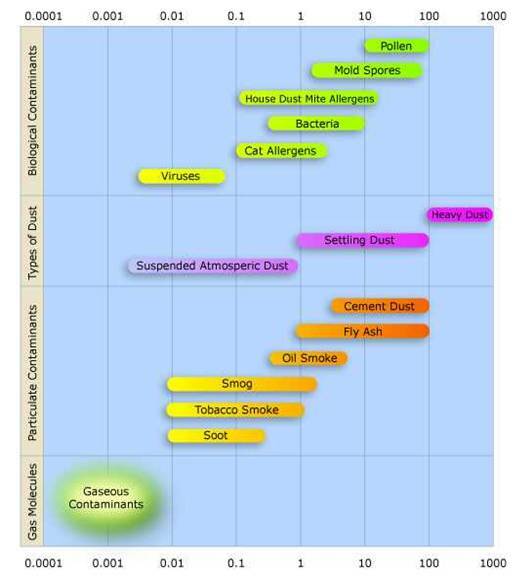 The graph shows that many common substances such as tobacco smoke, smog and dust also classify as particulate matter . Figure 1. Size Comparison of Particulate Matter with Human Hair. Obtained from Journal of Chemical and Pharmaceutical Research. Figure 2. How Particulate Matter Enters our Body. Figure 3. Comparison of Different Particulate Matter Candidates by Size. Luo, Y, Chen, H, Zhu, Q, Peng, C, Yang, G, Yang, Y, Zhang, Y. (2014). Relationship betweem Air Pollutants and Economic Development of the Provincial Capital Cities in China during the Past Decade. Plos One. 9 (8), 1-15.